For starters, there has been a lot of “gloom and doom” in the media, but here is a fun table from Charlie Bilello showing how the S&P 500 has historically performed very well in the months following each of CNBC’s gloom and doom “Markets in Turmoil” specials. The point is that the specials are aired after the market has sold-off and people are somewhat panicking, but the result is always strong performance from the markets in the months ahead. We interpret this as another reminder that the best time to buy (or at least hold, and NOT sell) is after a sell-off like the one that’s just occurred). And aside from just a technical pricing perspective, Guggenheim’s Chief Investment Officer offers a little fundamental perspective, and says stocks are cheap based on forward multiples and should rally 15%-20% from here. The point again is just that it’s usually unwise to panick after a sell-off. And to the contrary, it’s often a much more attractive time to buy (or at least hold what you’ve already got). The recent marketwide sell-off has impacted some stocks more than others. For example, the growth and momentum stocks that had been recently dominating the market, have sold-off more than the less volatile dividend and income securities. In a sense, this is exactly the way it is supposed to work… it’s the whole “risk versus reward” trade-off. If we define risk as volatility and reward as total returns, then the investments that offer the highest longer-term total returns also exhibit higher risk (volatility). Here a handful of interesting names on our “Disciplined Growth” watchlist and our “Income Equity” watchlist. 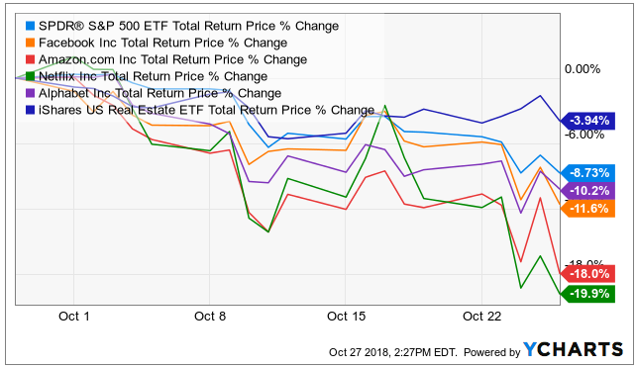 Not surprisingly, the Disciplined Growth stocks had been performing much better over the last year, but have sold-off significantly harder this month. In the long-term, we believe the Disciplined Growth stocks will deliver larger returns, but many investors simply prefer the income and lower volatility of the Income Equity securities, which can make perfectly smart sense, depending on your situation. And we’ve selected these individual securities (and written about them in the past) because we like their stock-specific qualities, as opposed to just blindly buying the whole market. Further still, here is a recent article about Netflix, that we agree with: RBC's Mark Mahaney: Netflix stock can 'double in three years'. Realistically, Netflix can more than double, Mr. Mahaney is just being conservative, in our view. When markets get volatile and sell-off, that’s when many investors make mistakes. For example, they sell some of their holdings and end up sitting on too much cash when the market rallies back (i.e. they miss out on the big returns of the rally). Or, investors get the “trading bug” and try to turn a quick profit by trading in and out of volatile names. This can work, but it requires a lot of discipline, and it only takes one bad trade to wipe out all of your profits. Further, it often results in investors again sitting on too much cash and missing out on the subsequent market rally, which has come after every single market sell-off in history (present sell-off pending, but we believe the market will rally back and eventually make new all-time highs—the question is not if, but how soon will the new highs come. Finally, “buy and hold” is a proven strategy for long-term success. Whether your strategy is to “buy and hold” dividend stocks or “buy and hold” growth stocks, they both work. What tends NOT to work, is when people try to switch up their strategy when volatility strikes and the market sells off, as it just has. Always remember your own personal goals as an investor, and don’t let noise and volatility distract you from working towards those goals. You can most certainly find a few opportunities for rebalancing, or replacing a stock or two when the market gets volatile (like it just did), but don’t desert your long-term strategy and goals! Yes, the market has been volatile. Yes the sell-off is not pleasant and makes investors nervous. Just remember, sell-offs are usually the right time to buy, not sell (be greedy when others are fearful, and fearful when others are greedy). You may be able to find a few opportunities to rebalance or reposition your investment portfolio, but don’t ditch your strategy or lose sight of your personal long-term goals. Investors often make an increased number of mistakes when the market sells-off, but it doesn’t have to be that way. Be smart. Older PostThe Fed’s Folly: Is The Growth Bubble Bursting?